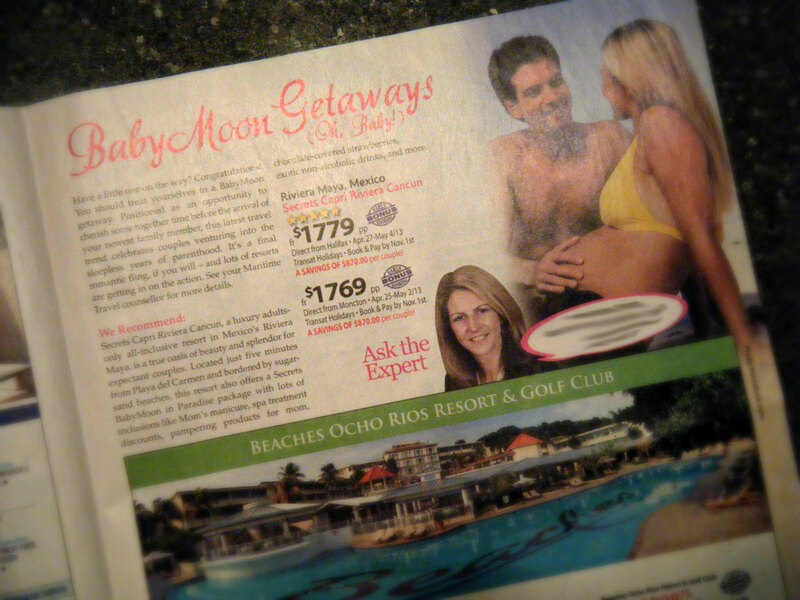 I first saw the word babymoon printed in a guilty-pleasure - trashy magazine - along with photographs of a bikini-clad celebrity gallivanting in the sand during a pre-labor getaway with her pelvic affiliate and her diminutive ankles. It's kind of hard to ignore the concept, what with circulars like this shoved in every other newspaper. But here's the thing. The babymoon trend has me feeling completely unconvinced. I’ll be honest here. When I was pregnant, the furthest thing from my mind was cherishing together time while experiencing a romantic fling on the beach - or anywhere for that matter. Reason being, I was far too busy working out the logistics of ejecting a small-but-mighty organism through a part of my body I hadn’t been able to get a clear visual on for months. Between my ever-expanding feet, my wildly indiscreet chest and my puffy reality-television-star pout, I was more concerned with just trying to appear human while I was in the process of producing one. Even if I had wanted a babymoon I would certainly have been banned at the departing gate because - let’s face it - an exhausted, gassy hippopotamus wearing a catsuit and knitted shoes, tends to draw attention at all-inclusive beachfront resorts. And not in a good way. So instead, my husband and I stayed home for the duration of my pregnancy and while I persistently weathered the relentless thrusts of hostile baby heels pressed firmly into my ribs, he diligently ran through several worst-case labor scenarios while staring in disbelief at the cartoon-like expansion of the figure waddling before him. We were a less-than idyllic pair. Bottom line -- babymoons are best left to those who believe in the concept of push presents. Mind you, I suppose I did fall victim to that trend. After a three day labor peppered with complications, I requested (and received!) a giant bottle of prune juice, which incidentally was worth its weight in diamonds.